The Lightbox Addon allows your website visitors to see your images in a highlighted fashion. It is easy to set up your sliders with the Lightbox addon. Master, Agency or Developer Soliloquy license. You can read how to upgrade to one of these licenses here. In this instance, you’ll be activating the Soliloquy Lightbox Addon. Now it’s time to enable the lightbox for your slider. To do this, navigate to the Lightbox tab and click the box for Enable Lightbox? and then configure your lightbox settings. 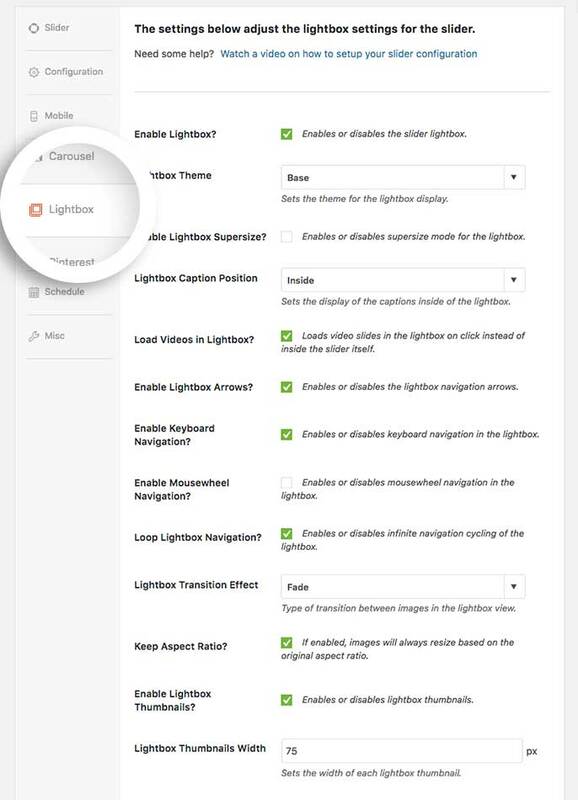 Would you like to change your lightbox theme? You can easily do that with the Slider Themes Addon, have a look at our documentation on How to use the Slider Themes Addon. Fixes: Mixed video and lightbox slides not loading. Fix: Thumbnails in Lightbox dropping onto two lines when a large number of thumbnails are displayed. Fix: Local videos sometimes would not fit inside lightbox, resulting in scrollbars being displayed. Fix: ID error on lightbox images in Edit Metadata window. Fix: ID error on lightbox images. Fix: Dynamic Addon when generating lightbox thumbnails within page attachments. Fixed bug with showing clone slide assets inside lightbox views. Added ability to allow shortcodes to be parsed inside of the lightbox captions. Fixed bug with JS object keys not being set properly and causing errors with the Dynamic Addon. Fixed bug where lightbox thumbnails were duplicated with video slides. Fixed bug where lightbox thumbnails were duplicated with slide transition. Fixed bug where lightbox thumbnails would not be generated if main slider cropping was turned off. Fixed bug with CSS styles in lightbox titles. Soliloquy and the Addons are now at v2! Please read the upgrade guide found by clicking on this link. Say hello to version 2.0!